Glass Doors — Marquee manufacturer and temporary structure sales. Last year we introduced our new solid walls. This year we’re further expanding our selection by adding new marquee glass doors and windows. The walling system offers greater insulation than the usual PVC walls (one piece or two piece). The same benefits carry over for the doors and windows, which in our opinion offers better security. For example, the doors are fully lockable. Similar to our Shield Solid Walling system, our doors offer greater security and better protection to the elements than the traditional one piece or two piece dutch lace wall. Each door is supplied with a lock and key. The glass doors, together with our solid walling, is commonly fitted in long term structures, such as temporary warehousing or for corporate event marquees. These are particularly useful for winter hires, such as Christmas or New Year events that take place at hotels and venues. The design is simple and easy to fit and with the panels being of a lightweight form, the system is cost effective to transport and straightforward to handle. The full wall is made up of a series of glass panels that slides down either a side ‘U’ profile channel or a corner ‘U’ Profile. 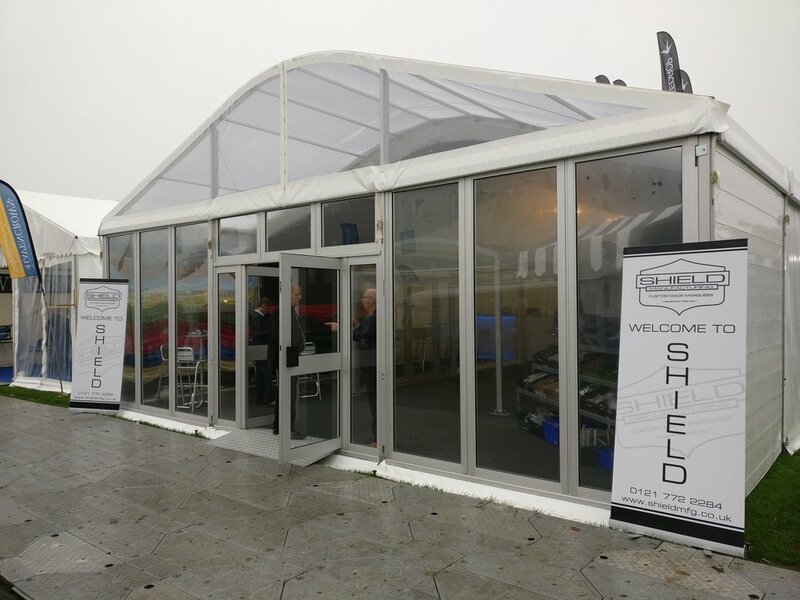 The aluminium U profiles can be supplied for either the 3m, 6m, or 9m (94mm x 48mm) marquee frames or for the 12m and 15m (114mm x 80mm) marquee frame. The standard width for the glass doors has been made for the 3 metre bay marquee, but can be made for a 5 metre bay, or an alternative bespoke size.